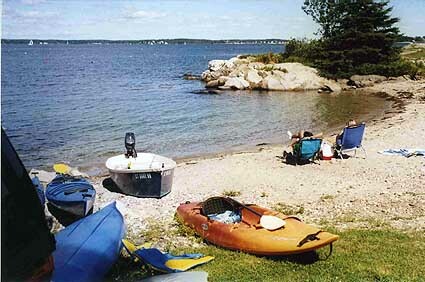 Maine Camping: The Only Oceanfront Campground in the Boothbay Harbor Region! No Pesticides - but don't worry, the salty air keeps the mosquitoes away! 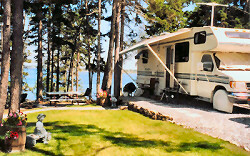 Please come and stay with us at our small, family owned and operated, eco-friendly campground! TENTING: Sorry, but after the 2016 season we will no longer have tenting sites available. Wouldn't you like to have a summer home like this by the ocean in beautiful, cool, quiet coastal Maine? If so, just put your camper on one of our Seasonal Sites, then kick back and relax! See more information and photos! Call us now at 207-633-4612 for full information on how to get started on your new summer seaside home! Take a virtual tour of Gray Homestead! Contact Us! Questions? Contact us by e-mail, phone, or U.S. Mail. We're proud to have been written up in New England Camping by Carol Connery and Stephen Gorman as one of the Top Rated Campgrounds! Inquire about our gift certificates for every occasion!